Calling all Designers, Makers, Crafters, Photographers & More! Applications are now open for our 2016 Porter Flea Holiday Market- start tinkering little elves! #PFHoliday16 runs December 9th & 10th at East Nashville's Skyway Studios. Applications must be submitted by midnight CST on October 16th. CLICK HERE TO APPLY! Don't want to worry about parking this weekend? No problem - take a LYFT! Lucky enough to grab a Friday Night Preview Market ticket? Our official rideshare partner, Lyft has provided a special offer just for our preview night attendees! If you're a new user, get $30 in free ride credit when you sign up at http://lyft.com/i/pfvip Already have Lyft? Save 15% off up to two rides to or from the preview night with code PFVIP15. Coming Saturday to our Main Market? Travel to Porter Flea with ease thanks to our rideshare partner, Lyft. If you're a new user, get two free rides (up to $10) when you sign up at http://lyft.com/i/porterflea20 Already have Lyft? Save 10% off up to two rides to or from Porter Flea with code PORTERFLEA10. TAX FREE WEEKEND - WHAT TO DO?! Welp. It’s that time of the year in Tennessee. The infamous tax free weekend! We have all heard of it, the Sales Tax Holiday in Tennessee. But what exactly is it? As vendors and makers, the big question is whether or not you need to charge sales tax on your goods the weekend of Porter Flea Summer Market. It happens every year. Tennessee has one weekend every year that is designated Tax Free. (I always try and purchase my computers on this day!) Since it is "Tax Free Weekend" it sounds like there is no sales tax on any purchase but unfortunately that is not the case. The sales tax holiday was actually designed in order to give parents and students a bit of a break whilst purchasing school supplies, not to give the general public a break on all sales tax. So what products are tax exempt? Some notable items that are still taxable: jewelry, handbags, woodworking items, cards, etc. are all still taxable for this weekend. Non­taxable: clothing that is under $100 such as shirts, jeans, backpacks, and other traditional attire are nontaxable this weekend. Do your products fall under the tax exempt category? If so, don’t worry about collecting tax on those items this weekend. If your products do not fall under the exempt listing, just treat this weekend like any other weekend! Califarmia comes together with a unique story. A group of friends working for a non-profit discovered Hopewell Gardens, one of their local sources. Everyone felt that a natural step after growing locally was to eat locally. 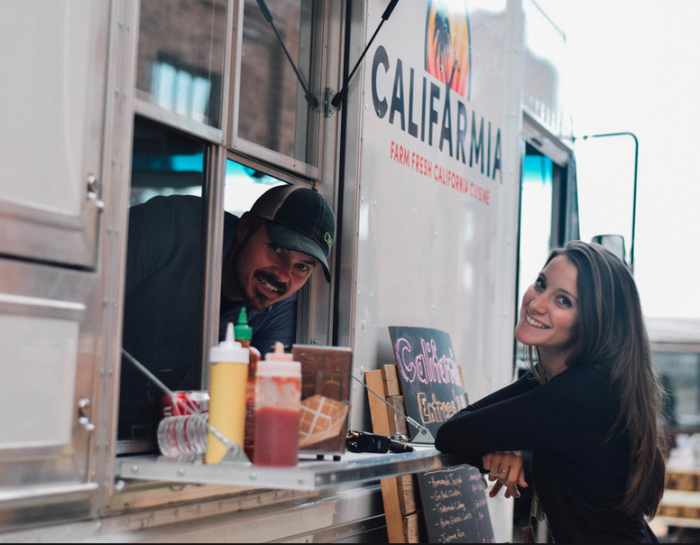 Porter Flea Preview Market attendees will find guaranteed fresh and healthy food at the Califarmia Food Truck. What a treat for all - local food and local art - all in one place! They will be bringing their goodness to the Porter Flea Preview Market night! Get your tickets today! Porter Flea's Summer Market will showcase Nashville's hottest food trucks bringing delicious fare to Porter Flea's savvy food connoisseurs. There will be plenty of choices for snacks, lunch, dessert and fun summer treats. No one is left behind because here is the best of the best: The Grilled Cheeserie, Bao Down, Crankees, Riddim N' Spice, Yayo's OMG, Hoss Burgers 2, Retro Sno, The Peach Truck, Franklin Juice, The King of Pops, Jeni's Street Treats and Califarmia. Shoppers will have no problem stepping out of the totally air conditioned Market after shopping up an appetite knowing what awaits them in the summer sun. 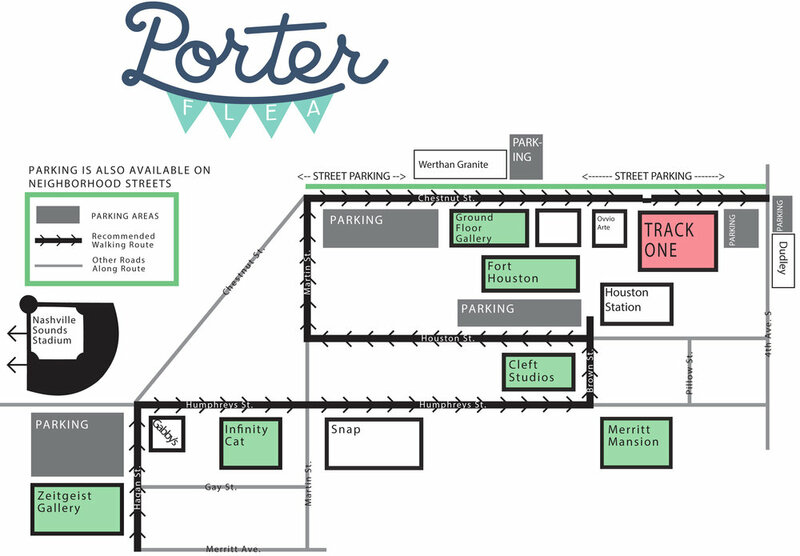 Don't we all just love summer, Nashville Food Trucks and Porter Flea all in one place! Bring your cash, cards and appetites to Porter Flea Saturday July 29. Don't miss the best one yet! 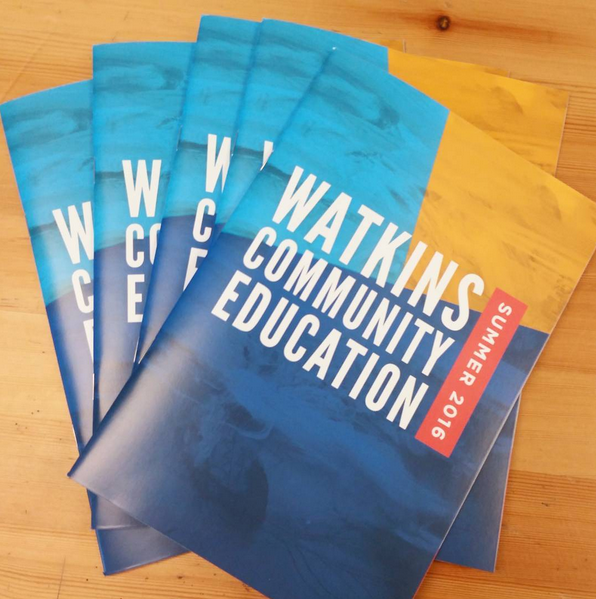 Porter Flea appreciates the support of Watkins College of Art Community Education Department. The mission of the CE program is to provide a distinctive education that will empower youth, teens and adults to embrace their artistic abilities and give them the tools to pursue a life of creativity. Porter Flea certainly understands and embraces this philosophy. Market attendees can look forward to a little creativity of their own. Look for the Watkins Art Institute table where the fabulous folks from Watkins have a fun project awaiting for you! Porter Flea welcomes first time sponsor Lightning 100 to our Summer Market. Lightning 100 puts the spotlight on Nashville, Tennessee’s independent music scene each week on air and at Friday Afternoon Live! Whether tuning in on the radio or visiting their website; it is obvious Lightning 100 cares about local artists. Porter Flea appreciates the folks at Lightning 100 turning their spotlight on Porter Flea July 29 and 30th at Skyways Studios in East Nashville. Nashville AND Porter Flea is the place to be to support talented local artisans. Thanks for shining on us Lightning 100! All Porter Flea fans should meet Matt Dudley from The Skillery located in the Germantown area of Nashville. Matt is so passionate about his vision for the The Skillery which is a rad, modern co-working space that inspires you to be creative the minute you enter the doors. 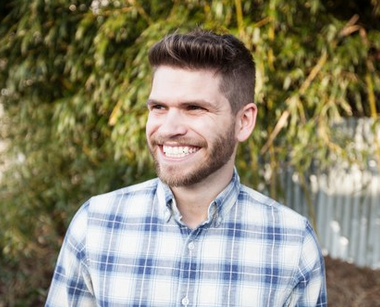 Matt believes every interaction is an opportunity for teaching and learning. Workshops, work spaces are designed for the single entrepreneur to collaborations to carefully chosen educational classes. Matt and The Skillery have been so supportive of Porter Flea vendors by providing not only that first cup of coffee to our vendors before the doors open on Saturday as well as inspiration and support and a place to dream and design. Thanks Matt for all you do for Porter Flea! Porter Flea appreciates the ongoing partnership with Brand Imaging Group (BIG). BIG provides knowledgeable sales consultants and guides us through all of our signage needs from start to finish. BIG has cutting-edge printing technology and offers solutions for small format signage all the way up to the large banners you will see outside of Skyways Studios for our Summer Market. BIG turns our ideas into high quality design signage that makes a big visual impression. Thanks BIG for being a huge part of our successful imaging for several years! Preview Market Tickets for Sale! Join us for our Friday, July 29th Preview Market from 6-9pm. We will be cooling off with brew from JACKALOPE along with Friday Night Only surprises from POPPY & MONROE, JENI'S SPLENDID ICE CREAMS, AND LOCAL HONEY. CLICK HERE to purchase online or visit some of our favorite shops to buy in person: WILDER, HEY ROOSTER & LOCAL HONEY. Nashville's favorite shopping tradition is back! 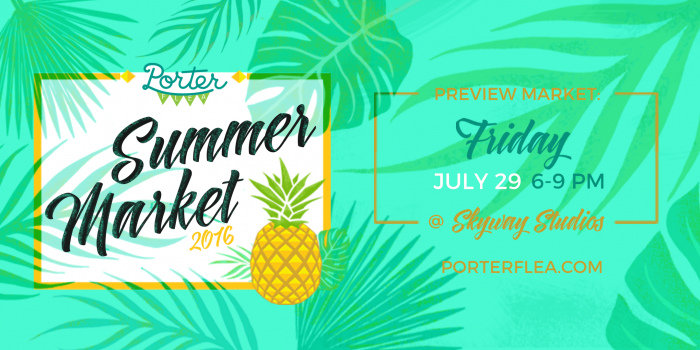 The Porter Flea Summer Market returns in late July 2016 to showcase hundreds of jury-picked vendors, thousands of the region's best handmade wares, the city’s finest food trucks and of course, a surprise or two. The festivities begin on July 29 from 6-9 p.m. with the Preview Market, a ticketed event that gives guests early access to the market and the opportunity to meet with vendors in an intimate setting. On Saturday, July 30th, 10 a.m. to 5 p.m., the Main Market is open to the public. #PFSummer16 will take place in brand new location, Skyway Studios, right off of Briley Parkway in East Nashville. Skyway features large, air conditioned indoor vendor space, as well as a large dedicated parking lot. We are now scanning the horizon for indie artists and entrepreneurs, anyone who makes a splash by creating apparel, accessories, prints, paper goods, or furniture. Apply now to be a vendor or make plans to beat the heat with us while you shop! Wow. Over the last several days, we’ve realized how lucky we are to have so many good friends and supporters in Nashville. Everything was coming together last week for our tenth and biggest market ever, when we had to make an unexpected but necessary change of venue to OZ Arts Nashville and we had only two days to reengineer all of the essential logistics for Porter Flea Holiday X 2015 (PFX). This was a make-it-work moment for Porter Flea, and although PFX did not turn out exactly they way we had been working so hard to produce --- we had everything planned for 142 vendors under one massive roof with minimal lines, which was simply not possible given the layout of the alternative event space --- this year’s holiday market probably would not have happened at all without the help of some generous and committed people. First and foremost, we owe an enormous debt of gratitude to the exceptional people at OZ Arts Nashville. The OZ team stepped up heroically to help us orchestrate PFX and proved once again what a vital role they play in Nashville’s contemporary art and design community. We cannot thank them enough for taking care of us in such a difficult predicament -- they quite literally saved the day. We also want to extend a huge THANK YOU to the thousands of people who came out to OZ to support the area’s best artisans on Saturday, who helped us spread the word about the urgent venue change, and who parked up to a mile away (!) to come to the market. Although the entrance line was never more than about 90 minutes long, that is far longer than we want for our markets, and we’re grateful for everyone’s patience and understanding that we were doing our very best all day to keep the line moving without overcrowding the aisles. We’re happy to report that PFX was a major success for the incredibly talented designers and makers that participated in the market, and we appreciate all the encouraging words we received from vendors who rallied with us to make the most of the situation. There are many, many other people to thank for helping us achieve a positive outcome under such challenging circumstances. We’re grateful to The Skillery for hosting our “situation room” last week when we were racing against the clock to secure and to develop a new plan for an alternative venue. We also leaned heavily upon and received crucial guidance from our good friends at the Metro Arts Commission, the Arts and Business Council, and the Nashville Fashion Alliance who helped us relocate our event as quickly as possible to OZ Arts Nashville. And we want to acknowledge several senior officials at Metro Codes and the Beer Board who helped answer so many questions and who helped us secure the proper permitting for our intended venue, even if those permits turned out not to be necessary. So many other key event logistics also had to be reconsidered by changing the event venue, and even though the PF team had very little time to do it, we are lucky to have great relationships with professional event vendors, particularly Bright Event Productions, Rock Solid Security, and Music City Tents and Events, who skillfully worked through these new challenges. Finally, we want to salute our generous sponsors, particularly Avenue Bank, NATIVE, Brand Imaging Group, Nashville Arts Magazine, the Nashville Scene, and Watkins University for helping us grow and enrich Nashville’s modern handmade marketplace. Thank you. We are so grateful to all of these people and organizations for helping us work through a difficult situation, and we are humbled by the amazing turnout, the encouraging words, and the constructive feedback we’ve received over the last week. We’re fortunate to be a part of such an engaged and supportive community, and we will continue to do everything we can to keep building a more satisfying market experience for makers and buyers alike. Thank you all for giving us the opportunity to celebrate 10 markets. We look forward to many more milestones ahead. We’ve got over over 140 of the finest local and regional designers! Don’t forget to bring your appetite to our Main Market: we’ve got 9 great Nashville food trucks--- The Grilled Cheeserie, Crankee's, Funk Seoul Brother, Riddim 'N Spice, Street Provisions, Bao Down, Smore Love, Bang Candy, Jeni's Ice Cream, and Franklin Juice ---plus Steadfast Coffee along with Y'alls Balls to fuel you up! Also Jackalope Brewing Company will be selling their crafty brews all day! Be sure and check our Porter Pantry & Parlour sponsored by Hey Rooster General Store & LOCAL HONEY! Enjoy our Photobooth from Smilebooth while listening to DJ sets all day long from Grimey’s and DJ Susan. Craftcourse will be bringing the holiday spirit yet again with their fantastic decor! **Street parking is available along with surrounding lots. Come ready to shop for everyone on your list! Hashtag it #pfholiday or #pfx! The 10th Porter Flea market on Friday and Saturday, December 4 and 5, is relocating to OZ Arts Nashville, but we are keeping the same dates and times and the same terrific lineup. Planning an event as large and complex as Porter Flea requires a lot of pieces to come together; from venue logistics to city permits, there are a lot of moving parts. There was a problem this week with our original location that could only be remedied by moving to OZ Arts Nashville. Porter Flea is excited to work with the incredible team at OZ to make this our biggest and best market ever. WHAT TO EXPECT OZ Arts Nashville is a beautiful, exciting venue, and we’re delighted to bring Porter Flea to it. You’ll still experience the same inviting and eclectic holiday shopping experience you’ve come to expect from Porter Flea with the . With plenty of street and surface-lot parking, and Metro police and private security to help guide you as you arrive, OZ Arts Nashville is ready to host Nashville’s premier holiday market — and all of you — this weekend. Porter Flea Holiday is back and bigger than ever! Porter Flea returns on December 4th & 5th for our tenth modern handmade market event: Porter Flea Holiday X. Get ready to be a part of the festivities! We are now accepting applications from the area’s most talented designers, makers, and artisans. Be part of our Holiday extravaganza. To celebrate ten markets ("X"), we want to feature some special design collaborations between the area's best makers. We want to showcase the incredible creative talent in our community by pairing up Textiles x Apparel Design, Screen Printing x Furniture Design, Pottery x Jewelry, and many other unique design collabs for the most outstanding handmade gifts in the southeast. It keeps getting better: for PFX, we're moving back to East Nashville with a massive new venue — more heated space for more shoppers equals maximum convenience. With the extra capacity, PFX will also feature both the Porter Pantry and the Porter Parlour offering some of the finest artisanal food products and handmade personal care and beauty products to help make holiday gift shopping a cinch. Porter Flea Holiday X will run over two days at Silver Point Studios on 10 Quality Way starting Friday evening, December 4th, with our ticketed Preview Market from 6 p.m. to 9 p.m. Our Main Market will run 10 a.m. to 5 p.m. on Saturday, December 5th, with open access to more than 100 talented, jury-picked vendors, thousands of one-of-a-kind handmade gifts, a collection of the city’s finest food trucks, and just the right amount of holiday cheer. Come join us and see why PFX will set the new standard for Nashville's modern handmade marketplace. We’ve got over over 90 of the finest local and regional designers! Don’t forget to bring your appetite: we’ve got 7 great food trucks — The Grilled Cheeserie, Yayo's OMG, Riddim N' Spice, Retro Sno, Franklin Juice Co, The Peach Truck, and Crankee’s — plus Steadfast Coffee along with Y'alls Balls to fuel you up! Also Jackalope Brewing Company will be selling their crafty brews all day at the market entrance! Be sure and check out the new Porter Parlour sponsored by LOCAL HONEY! Enjoy our Photobooth from Smilebooth while listening to DJ sets all day long from Grimey’s and DJ Susan. Craftcourse will be holding down the Etsy Craft Party on Friday night and from 2-4pm on Saturday. Come ready to "treat yo self" and bring your appetite!